Slice pepper, courgette and chorizo any way that suits, and place in an oven dish. Measure milk and add 4 eggs, salt and pepper, and a teaspoon of smoked paprika and whisk until combined. Pour liquid egg mixture over the vegetables and chorizo, place in the oven at 200 °C for 20-30 minutes (depending on depth and size of dish). When removing from oven, stab with a knife to check it's cooked all the way through. Serve with salad. 8 members have added this recipe to their cookbook. 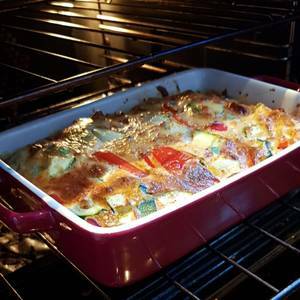 There are 424 calories in 1 serving of Frittata. Calorie Breakdown: 64% fat, 9% carbs, 27% prot.